Ahly defender Mohamed Naguib will be out of action indefinitely as he recovers from a knee cartilage injury, while playmaker Walid Soliman is fit for Saturday's match against Guinea's Horoya AC in the African Champions League, the Cairo giants announced on Monday. "Scans revealed that Naguib is suffering from torn knee cartilage. He will undergo surgery as soon as possible," Ahly's doctor Khaled Mahmoud was quoted as saying by the club's official website. Naguib, Soliman, and defender Saad Samir all picked up different injuries in Friday's 0-0 draw against Horoya in the first leg of the African Champions League quarterfinals. Last year's runners-up, Ahly, will be firm favourites to advance to the last four when they host Horoya in the second leg at Cairo's Al-Salam Stadium on Saturday. The injury of both Naguib and Samir is a big blow for Ahly's defence line ahead of Saturday's match, but Soliman’s return to the pitch is sure to boost the Reds in the decisive match. "Soliman will be ready for the Horoya match after recovering from a muscular strain," said Ahly's assistant coach Mohamed Youssef. "We have had continuous attempts to prepare Saad (who was suffering from a hamstring injury) for the match. He still has a chance for being fit," he added. Winger Mido Gaber and midfielder Amr El-Sulaya missed Ahly's trip to Guienia due to muscular injures, but the former could be available for the return match. "We are working on preparing Gaber, but El-Sulaya won't be available as he still needs more time to complete his rehabilitation," Youssef explained. 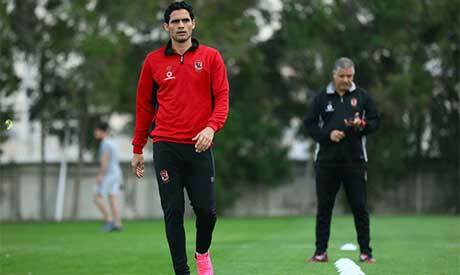 Ahly are eyeing a record-extending ninth title and their first since 2013.